Ignoring, no, deleting the spam comment thoughtfully sidelined by WordPress on a “Practical Pregnancy Plan” as I logged in today, this is a post with a few unanswered “Why’s”? A simple question I always dreaded hearing from a client. Demanding of an explanation, when often none was rationally to hand. I tended to flip it, and say in certain situations “Why” wasn’t the right question to ask. Or if it was, then certainly, I was incapable of producing a meaningful answer. The need to understand is rooted deep in many of us. But then move on, perhaps enriched, perhaps having learned a valuable lesson. Perhaps now better prepared for the next curve ball lobbed in our direction. The garden and landscape seem full of such questions just now. We simply haven’t had enough water, fresh or salvaged to save everything that’s seriously water stressed. Many of our favourite Himalayan or Asian origin plants which thrive in our constant high moisture environment are close to failing. Having recently discovered the wonderful Met Office rain radar site, click here, why has rain recently fallen all around us, yet a small area centred around Mynydd Llanllwni stayed so dry? My suspicion is that a huge mountain, devoid of any surface moisture, heats up significantly under weeks of sunshine and the thermal mass and retained absorbed energy is sufficient to affect moisture laden clouds heading our way. Amongst our Hydrangeras, the aspera group seems much less tolerant than the panniculatas, or arborescens forms. H. “Blaumeise” seems tougher than H.”Tiara”. Strangely many evergreen Skimmias and mature Daphne bholuas seem very drought tolerant, yet Leucothoes are only just hanging on. Why the difference? Is it improved water uptake, or reduced water transpiration? Or both? Who knows. With little water available at root level, most plants have struggled to flower well, or sustain flowers for any length of time. The impact for many invertebrates on availability of pollen and nectar must be significant, so it was a delight that a visit by Clare Flynn from Bumblebee Conservation Trust (BCT) to survey our bumblebees was so successful. She managed to find many bumblebees, of 7 different species, including a Cuckoo bumblebee, Bombus vestalis, which I’d never seen before (above), and Clare was particularly pleased to confirm this, once she’d temporarily popped into a pot to examine more closely… Convinced by the day’s results that we do have vibrant bumblebee populations here, I felt I should try to record these insects in a more meaningful way and so have set up a transect walk using BCT’s Beewalk programme. Click here. I shall resort now to a simple home designed spreadsheet (thanks to Fiona) which will be quicker and hopefully more resilient, if not as shareable. However the very helpful staff at BCT have now offered to input my data if I can get it to them on such an Excel based spreadsheet. Well done indeed to them. My initial walk around the garden and 2 of our meadows, of about 1300 metres length, and recorded in bee walk fashion – noting any bees seen 2 metres either side of the route, and 4 metres ahead – recorded 101 bumblebees and 6 honeybees. What will be very interesting to monitor, if I can manage to repeat this often enough, is the range of flowers the bees visit through the year. In part this obviously reflects the number of available flowers in the garden and meadows at a particular time, and which are close to my route, but is also obviously influenced by the bees’ preferences. An initial glance at my figures suggests that over 60 % of the bees on this first walk were found on just 3 flower species – Common Knapweed, Centaurea nigra, Marjoram, Origanum vulgare, and Greater Birdsfoot Trefoil, Lotus pedunculatus. All native species in peak flower during the last week of July. Buddleja and Stachys officinalis flowers accounted for another 15% of their flower visits. So a very narrow selection given all the different flowers still available in the garden and meadows. I wonder to what extent these are the species in this year of extreme drought conditions which have coped best and continued to flower well, and still produce a good nectar and pollen resource for the bees? The Trefoil flowers are growing in our wet meadow and so haven’t been as affected by water shortage, but the Knapweed, Marjoram and Buddleja certainly seem to have coped better than many other plants in very poor dry soils. 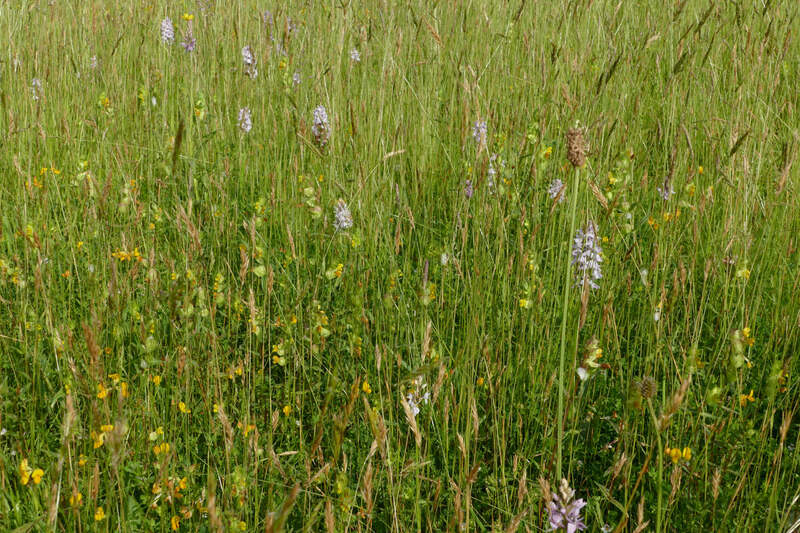 Using trials based on common calcareous grassland species in the UK, an ecosystem type which is naturally held to be quite drought resistant anyway, they found that flower abundance, flowers actually containing any nectar, and nectar quantity per flower, were all reduced significantly by drought conditions. Clearly this would likely impact on pollinator behaviour and populations as well. In spite of this concern about pollinators, Gelli Uchaf has recently once more had a hive of honeybees installed thanks to the kind efforts of Tony, Elaine and Sandy from Lampeter beekeepers. I just hope they’re still here! The second day after they arrived, lots of honeybees were obvious around the garden, collecting pollen, but 5 days later a very hot day saw a lot of bee “milling around ” activity outside the hive, and now there seem far fewer bees entering and leaving. Might some of them have swarmed? Tony will fill me in on his next visit to check them. (They are still there!) I love to see honeybees working in the garden, but have long felt that I simply don’t have time to manage a hive, so Tony’s offer to place a hive on site and manage it was too good to decline. The last 3 days have seen a huge variety of insects in the garden. Many familiar, some occasional sightings and 3 significant new ones. Not to be outdone the Lysimachia clethroides – another wonderful insect friendly flower for many flies and butterflies, yet a plant which had to be given water to prevent its collapse this week, caught my eye as a very large bodied furry black fly carefully worked its way around the tiny white flowers on the bending goose-necked inflorescence. I’d not seen this one before, but armed with some good photos and a simple phrase like “large bodied black hairy fly like bumblebee” quickly tracked it down on google. Tachina grossa is one of the largest flies in Europe, and as with many oddities it turns out that whilst the adult is strictly vegetarian, feeding off nectar or pollen, the lifecycle involves the fly finding the caterpillars of large moths – Eggars, Lappets, some Hawk moths and the Fox Moth, which certainly is locally common – to lay its eggs on. The fly’s larva then eats the caterpillar. Click here for more on Tachina grossa in the UK. Finally I found this Ichneumon wasp ovipositing beneath a Knapweed flower. There are over 24,000 species of these parasitoid wasps which have been described around the world. Many more are thought to exist, and whilst the adults feed on nectar and pollen, their larvae parasitise other invertebrates like aphids, moths, flies and butterflies, and are significant controlling influences on the over expansion of such prey species. The modified sting/ovipositor can be very long indeed, and although of considerable length is controlled with great accuracy by the female wasp, with it often being guided into place by tapping of the wasp’s antennae to locate a cavity in the plant tissue, as in this case, which indicates the presence of the target larva beneath the surface. The hypodermic like ovipositor (which lies protected within the wider sheath, when not in use) is capable of delivering an egg from the female, followed by venom, either adjacent to, or directly into the target larva, and on emergence the ichneumonid larva then begins to eat the host, eventually reaching maturity and pupating, before emerging from the now dead host as an adult wasp. This wasp is of a very small scale, as can be seen by comparison with a Bombus pascuorum worker. Readers may recall that back in 2013, I managed to photograph the largest European Ichneumon wasp ovipositing on a log outside our back door. Click here for more on this. 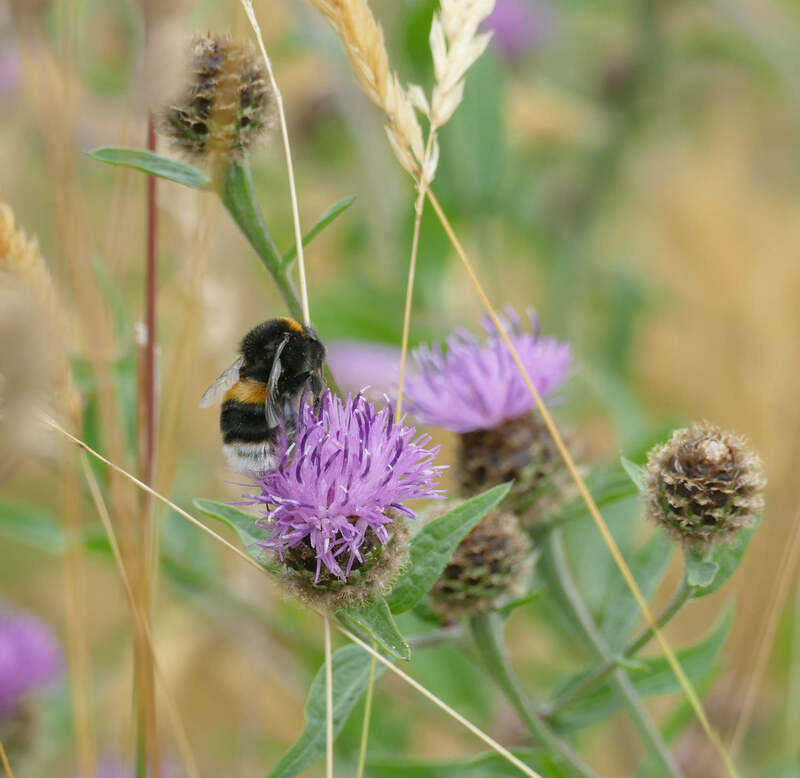 Click here for more on the huge range of invertebrates which use Knapweed as a vital food, or host plant – all interconnected in an amazingly diverse web of life. A study completed more than 70 years ago, and focused on a habitat just 3 miles from where I completed my clinical veterinary studies. 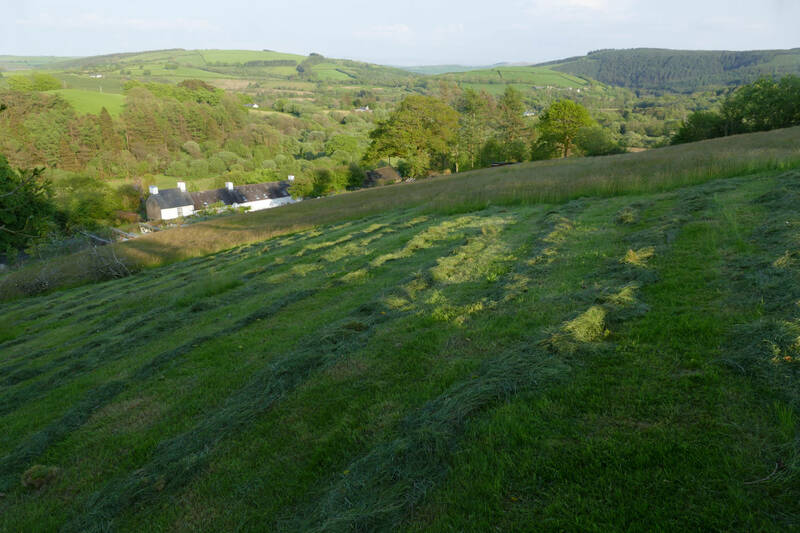 I posted this piece recently for the Carmarthenshire Meadows Group (CMG) and am including it here for any readers who might might be interested. 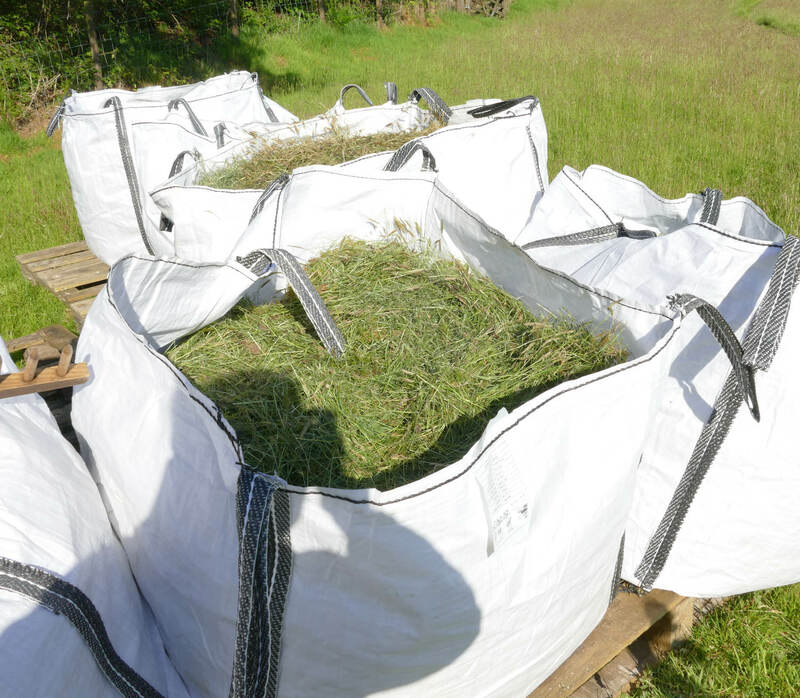 For any meadow owners who’ve had to cut a crop for hay or haylage it’s clearly been the best year in ages for getting it into a shed or wrapped with no problems, though perhaps quantities are reduced after the cold late spring and then very dry weather from May onwards. 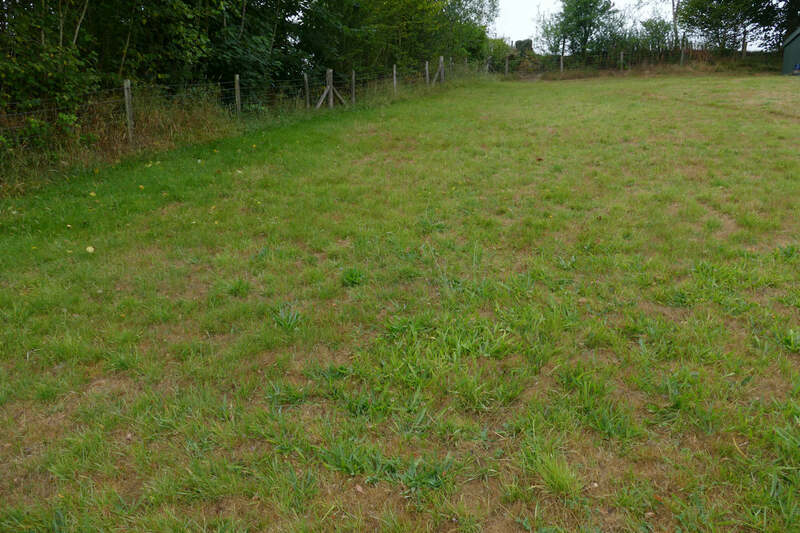 But for anyone who has stock that are grazing their land permanently, there are currently likely to be huge issues with the lack of aftermath regrowth. Our total annual rainfall here, since I began measuring it, has ranged from 1600 to 2150 mm. Monthly maximas from 534 mm in December 2015 downwards. 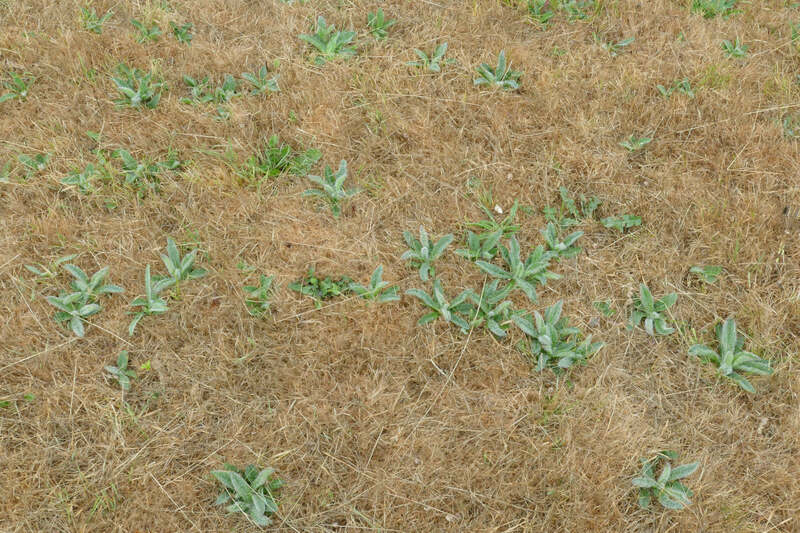 Our previous longest summer dry spell saw 95 mm fall in June and July of August 2014. This year we have had just 89 mm since May 1st. So I’m sharing some of our experiences this year. 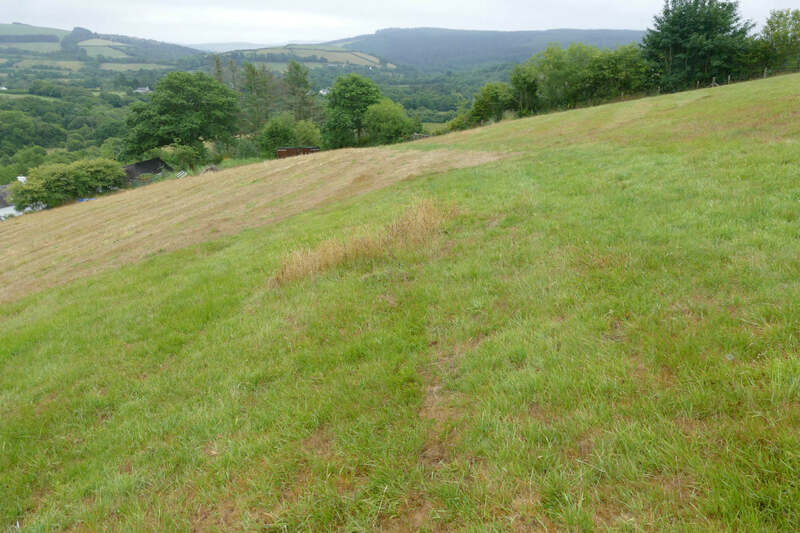 We only take a hay crop off part of 2 (out of 6) paddocks – 1 upland sloping, 1 valley bottom wet, which we need for our small flock of Tor Ddu sheep. We do this semi manually, by cutting with a walk behind BCS Powerscythe, turning mainly now with a mini Molon turner which fits onto the BCS power unit, which also rows the hay up. Although under some conditions manual turning works better. 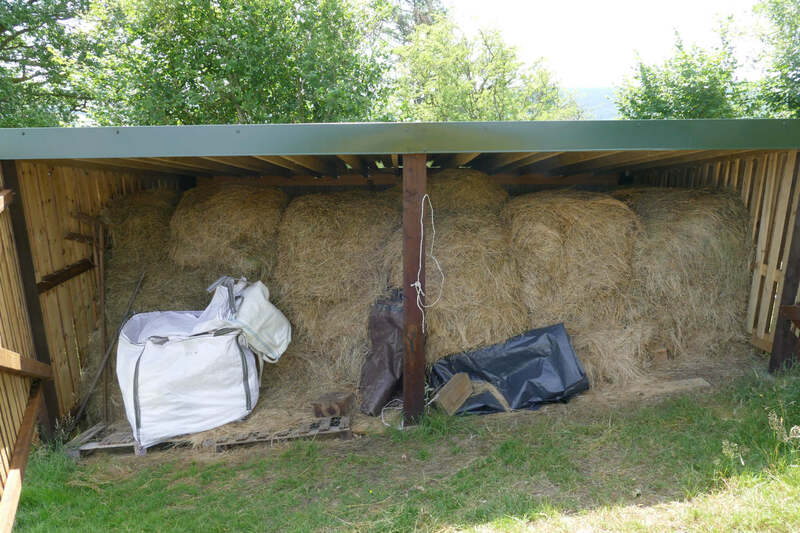 The hay is then raked and manually stuffed into Big Bags and dragged off the fields and stored loose in small hay sheds. (We’ve found it stores better out of the bags). 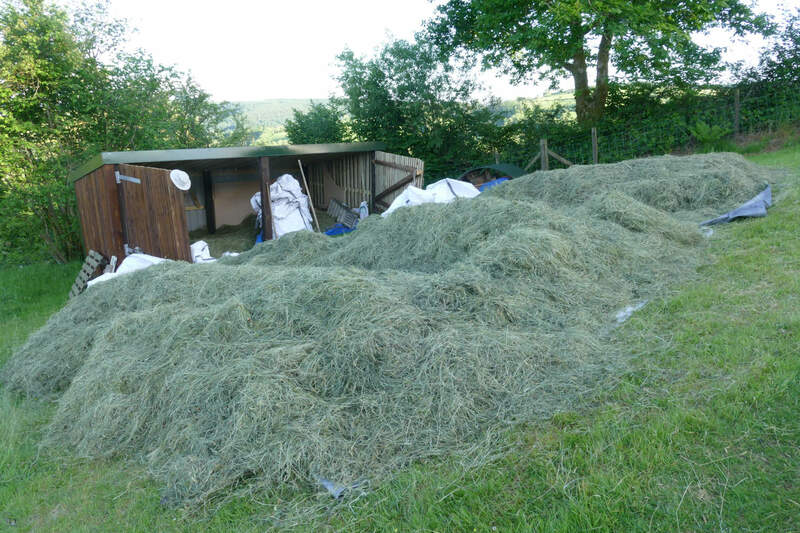 The manual effort involved in this means, as old fogies, we can never cut more than a small amount in 1 day, since we have to be prepared to make hay in 48 hours, which has been the default maximum time between showers for many recent summers until this summer of 2018. In the end we’d got all of our designated hay areas in both fields finished by the last week in June. 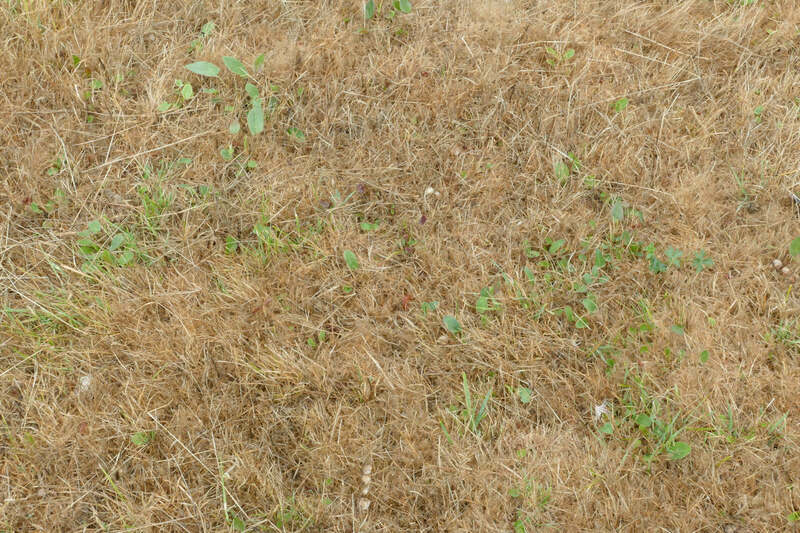 Way too early for wildflower seed set? Well, interestingly, the very early first cut areas behaved as though they’d had a Chelsea chop (in gardening parlance). Since the annual Yellow Rattle was beheaded before any seed was set, it regrew, flowered and set seed after the main crop in the centre of the field had finished – a great extra resource for nectar seeking insects… . 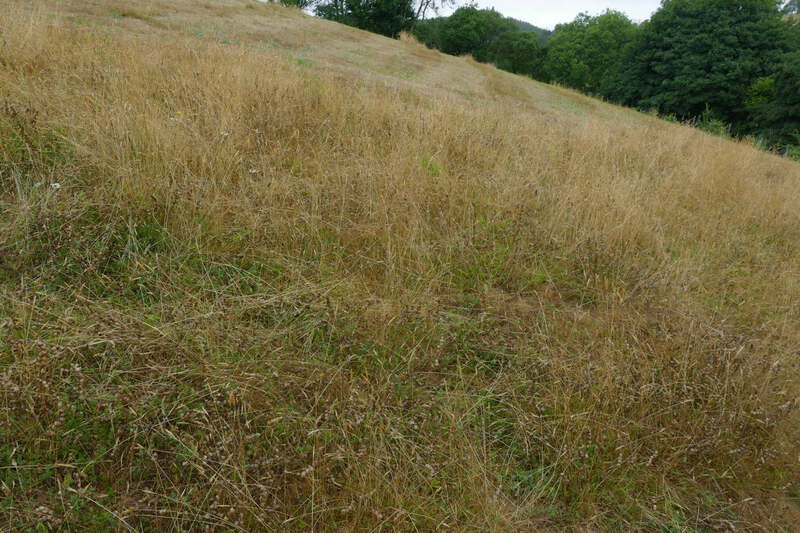 Although the masses of Sweet Vernal grass, which is our primary grass species in the upper meadow, had flowered in the early cut sections, it hadn’t set seed. However this grass species hasn’t produced much of a second flush of flowers. 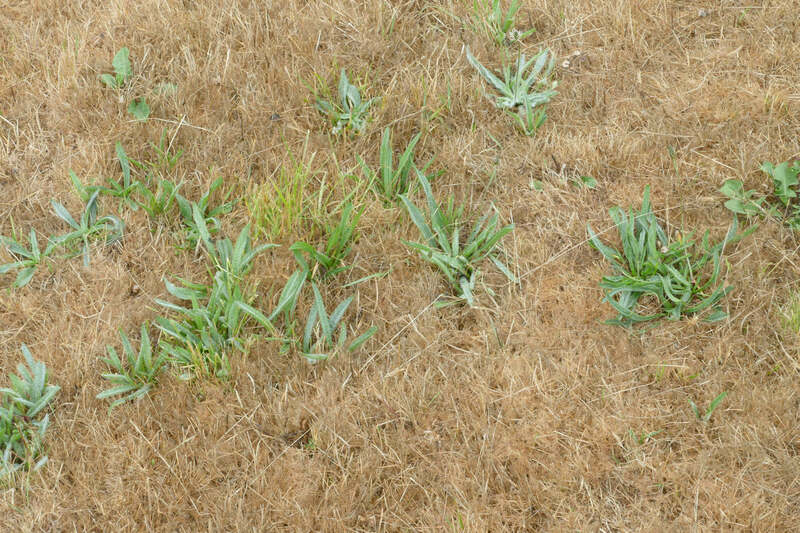 Instead the later flowering grasses (including ? 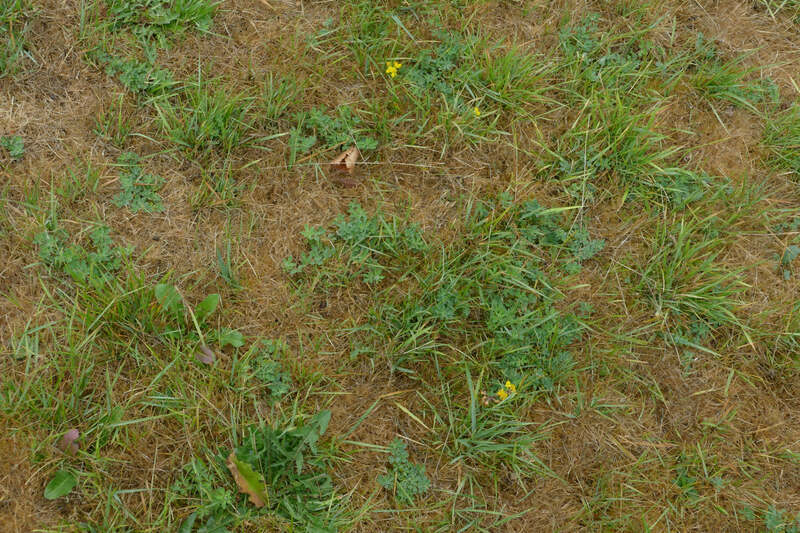 Common Bent – I’m not a grass expert!) have now produced seed heads. 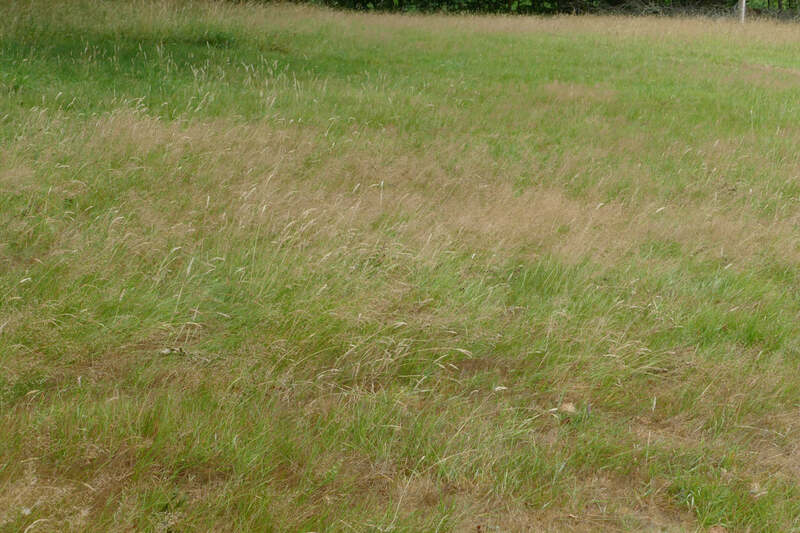 How do other areas of this meadow look now? 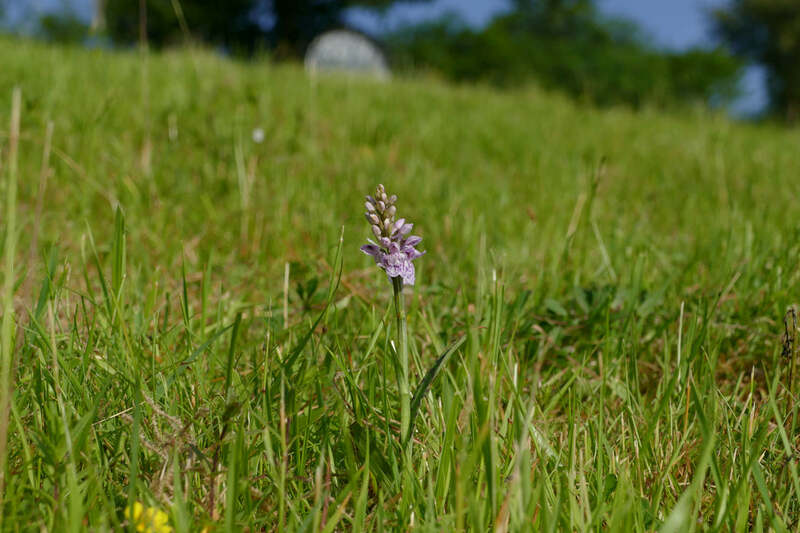 Some small sections with the majority of the increasing orchid count … (83 this year, up from just 1 flower, 4 years ago) are still uncut and now straw like in appearance…. At some point we’ll need to wean our lambs onto this field, so even with our low stocking density we do need some aftermath grazing! 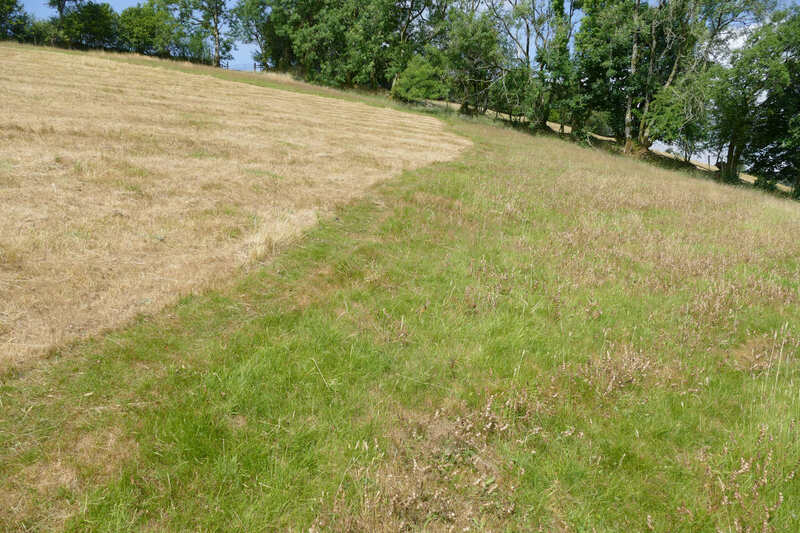 Shifting these meadows towards greater diversity, and cutting early (at least some sections) will definitely have helped overall productivity in the very dry conditions of 2018. In addition it may have really helped all the invertebrate life which would been more impacted with conventional removal of all the crop at one time. Obviously, however, this piece-meal approach won’t easily work with larger machinery or with a contractor, but for any with smaller areas, say less than 2 acres, it could be an option to consider. • A modelling exercise to determine economic and environmental impacts of the mixtures at farm-scale. You can read a review of a discussion workshop of its first year’s results by clicking here. Click here for more detail on the study which will run for 5 years. 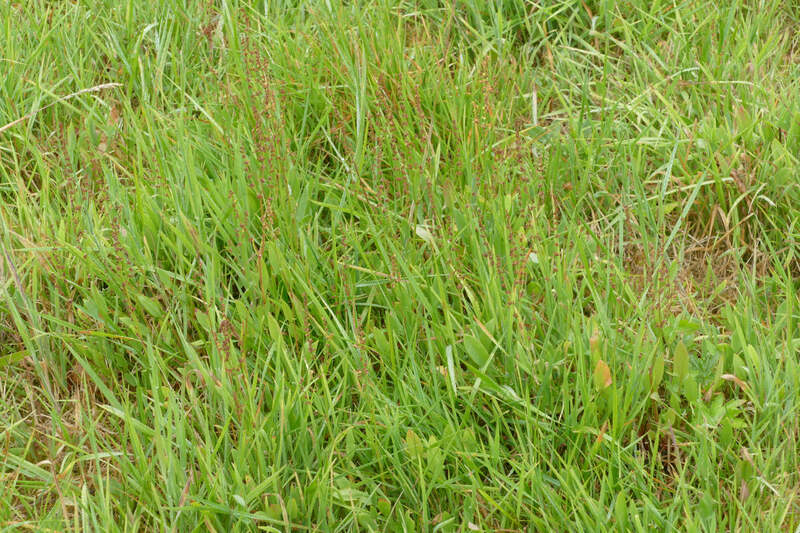 Although it’s clearly aimed much more at commercial farmers, than a typical CMG member, it may raise awareness of the benefits of sward diversity, and after the 2018 results are available, it may indeed highlight the fact that in extreme weather, having all your fodder eggs in the perennial ryegarass basket is a very dangerous thing to do. 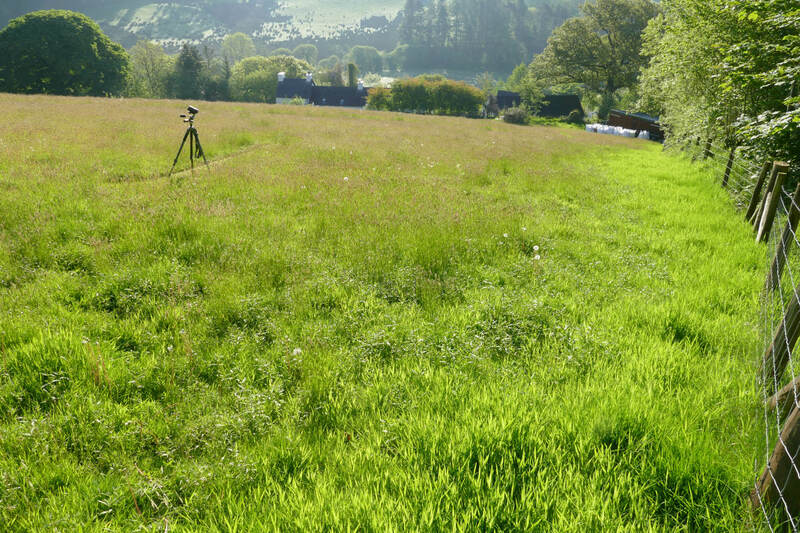 Most readers on this site will of course already be aware of the huge benefits of species diversity in grassland – that’s partly really why CMG exists, but it’s great to see that some hard data on species diversity in pasture may gradually be accumulated and affect mainstream agricultural practice, once a study like this has been completed. After 20 minutes the rain abated and I was delighted to find Lucy had appeared from shelter to begin her presentation to the 3 hardy souls who’d arrived to listen. The initial phase of her trial has been to grow 4 different, commercially produced mixes of annual flowers on 16 square metre plots replicated 5 times, in 2 different locations. The seed was sown onto rotovated ground which had been raked over, in late March to April. To achieve even coverage, the seed was mixed with horticultural fine sand to ease uniformity of sowing and then hand scattered, trodden in, left uncovered, and not watered artificially. The plots seem to have had very good and even germination, but inevitably hand weeding of the plots was required early on, and Lucy has since then recorded the species of bees (bumble and solitary, as well as hover flies) at monthly intervals, which have visited the different flowers as they have opened. In addition bees have been sampled for pollen to discover which other flowers they might have visited. 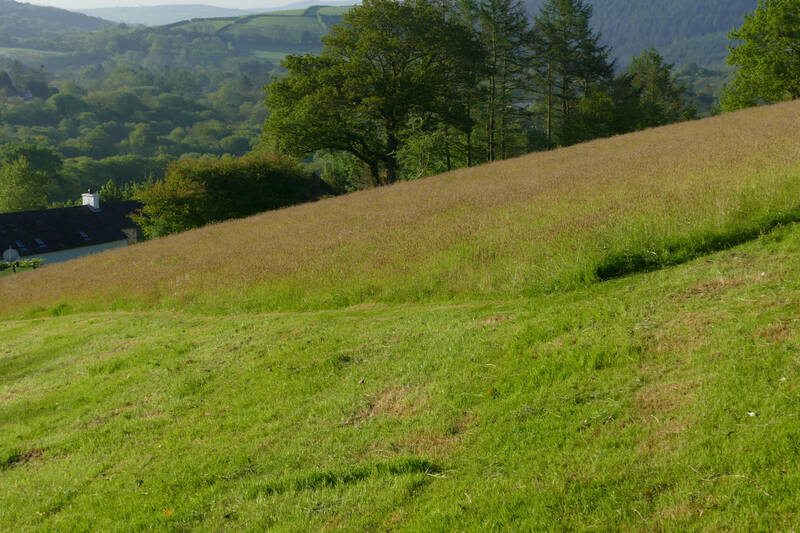 Lucy’s long term aim is to continue the trial next year with her own selection of plant species, and ultimately to prepare mixes of seeds of suitable plants which can be grown in this way successfully by gardeners both in Wales and further afield. Lucy will have much more information to pass on in the years ahead, so it’s well worth looking out for her blog updates or further presentations. Many thanks for her continuing with the event in spite of the weather! Click here for more on Lucy’s work at the NBGW. I drove home through continuous heavy rain to find the gauge at Gelli Uchaf nearly empty. The showers had passed South. Fortunately the weekend saw our fortunes change and significant rainfall. Yesterday, as we were confined to the house for much of the day by steady rain, exchanging stories with my visiting brother and wife about childhood memories, Australian poisonous snakes, and how they impact on rural gardening there, Fiona noticed a sudden gathering of what looked like swallows on a hazel tree beyond out terrace garden. Perhaps 40 or 50 clung to the upper branches of the tree, both Swallows and House Martins, as quite heavy rain fell. This is a really unusual sight here – sometimes swallows gather on our phone wires in moderate numbers, but I can’t recall ever seeing so many grouped low down, hirundine cousins intermingled, rain bouncing down on black and white backs and rusty bibs. Long tails and stubbier ones occasionally in view as they took off and landed, taking the place of the unseasonably early shed leaves on the upper twiggy branches. What had brought them in so low, and why had this “flight” paused in the rain to gather on the hazel? Apparently the 2 species will occasionally interbreed, and usually feed within 450 metres of their nesting site. For some reason the martins never seem to nest beneath our eaves, instead preferring our neighbour’s property. On the basis of this gathering, it seems to have been a successful breeding season so far. We’d headed for the water’s edge. Leaving the beached, bleached bodies and camera behind, the stretching sands took us to estuary’s mouth. The tide had just turned, and was rushing back, so quickly we savoured the empty expanse of fixed, rippled sands, bleeding into Western seas. And the calm, horizon sky. We returned through dunes, deserted. The colour had mainly gone. But here and there tall, fading, twisted orange flowers of fragrant evening primrose had caught the intensity of the recent heat in their day’s blooming; a single plant with tiny flowered closing storksbills prepared to fling its few dry augured seeds to drill down and colonise across the naked sand; bumbles found the the clumps of unidentified flowers of mauve and blue, and gorged. We bent and found our own nectar – the scent of ripened pods of bee orchids, erect, yet dessicated; stiff brown; burned vanilla filled our nostrils, with eyes closed. Moving on, a climb past splitting boar and greening poems to find the still standing roundhouse in a special grove; then, later, vodka fuelled Siberian composition erupted from the glossy black grand, beneath the modern oak arches. A lost friend’s elegy re-imagined with English fingers, on a German piano in a Welsh, evening landscape. Modest’s glorious pictures, listened to with rapture. This entry was posted in gardening, Meadows, nature, photography, wildflowers and tagged Bombus vestalis, Bumblebee conservation trust bee walk, Emperor Drangonfly, Gelli Uchaf garden, Golden ringed dragon fly, Ichneumon wasp on Knapweed, Silver-washed fritillary, Southern Hawker Dragonfly, Tachina grossa by thegardenimpressionists - Julian and Fiona Wormald. Bookmark the permalink. Did you see any solitary bees on your bee walk? Here marjoram is very popular with some Lasioglossum species. Solitary bees are a bit challenging but I think Clare is being overly pessimistic about identification. I can identify quite a few from a good photograph or several photos so it’s worth a try and I find it is very absorbing. I learn more each year. I was interested in your thoughts about your lack of rain when there was rain all about. They may be relevant to us here as we were in the same situation and we are tucked in among hills. Wonderful photos as usual….love the dragonflies! Lucy has worked very hard on the wildflowers…I’m going to follow her work as it looks very interesting. Swallows and swifts nest in/on our house but house martins go next door! Swallows line up on our line but house martins don’t join them…watching nature can take over one’s life and then there’s always the question…why do they do that? Thanks goodness for Annie Lennox! Thanks Marianne for a very interesting comment – and in particular that you also find that swallows and martins don’t usually spend time together – we thought it was an unusual sighting. I’m very envious of your swifts – they used to nest at our neighbours, but we haven’t had them in our valley for years now, and I miss their scimitared flight and raucous shrill screeching. Lucy gave a brilliant presentation, and her work is very well thought out. The swifts make our summer…they race around the house screaming and ducking and diving…we are so fortunate! Goodness! For a drought stressed garden, it looks great. Ours do not look that green even in spring! Thanks Tony – an interesting perspective – its all relative I suppose, but we were speaking to the head gardener at nearby Aberglasney yesterday and he reckoned it was the driest summer since the 1940’s in this part of the world. The thing is West Wales is spoiled (usually!) with its high rainfall, so we’re accustomed to the green, green grass of home ( to quote Tom Jones!). Crispy plants are just so scary! Beautiful photographs! The summer drought gave the garden and its tiny inhabitants a hard time.